The Roanoke Valley Leadership Series is a free event and no fundraising will be conducted. 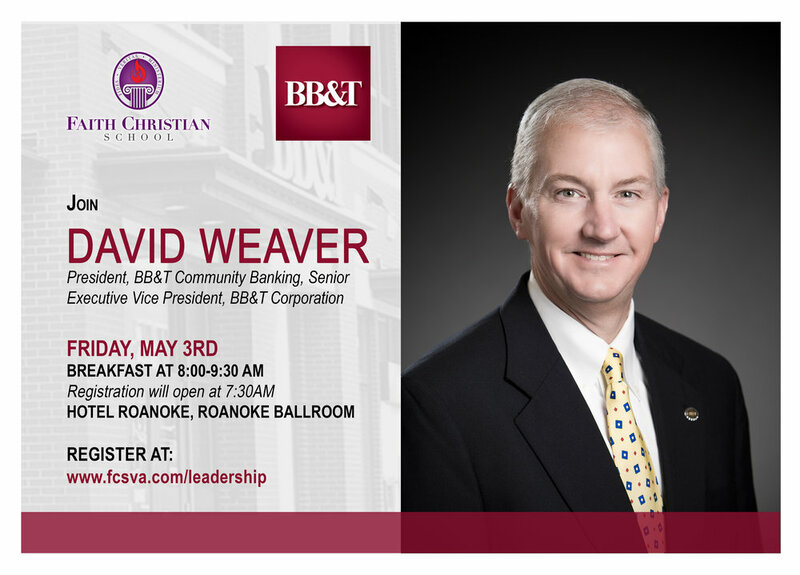 David Weaver is a 30-year veteran of the banking industry and serves as senior executive vice president and President, Community Banking. In this capacity, he is responsible for all aspects of commercial banking, including treasury services, working capital solutions, dealer commercial services and small business banking in our 20 banking regions. Weaver began his career with BB&T in 1995 serving as a business services officer and then city executive in Raleigh, N.C. In 2005 he was named regional president of BB&T’s Triangle Region. In 2010 he was named Community Bank Group Executive responsible for nine regions in six states: North Carolina (three regions); Virginia (two regions); South Carolina, Tennessee, Alabama and Pennsylvania. Weaver was named to BB&T’s executive management team in 2016 and in 2017 he was named President, Community Banking. Currently, Weaver serves on the advisory board of the Ronald McDonald House, Executive Committee of the North Carolina Chamber of Commerce and the Executive Committee of the Dix Park Conservancy. He has served as board member of the Greater Raleigh Chamber of Commerce; trustee of Wake Education Partnership; board member of Communities in Schools of North Carolina; Wake County chairman of the United Way of the Greater Triangle; community board advisor for the Junior League of Raleigh; the advisory board for Five Points Capital; and class agent and alumni council member of Ravenscroft School. Weaver earned his bachelor’s degree in business administration and MBA from the University of North Carolina, Chapel Hill. We invite you to learn more about Faith Christian School by watching our video series: Why Faith?